Leftover currency? 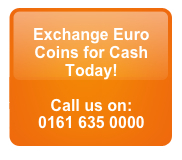 – Exchange 1 Euro coins today. There are lots of people with a collection of 1 and 2 Euro coins from trips abroad, change received from charities or shops. For most people and organisations this currency has no value because it cannot be exchanged back into Sterling. So most of the time it simply goes to waste. The most common coin in circulation is the 1 Euro with and estimated 6.2 billion floating around! This includes many millions that are not in the Eurozone but in other countries taken home from holidays and trips. However, here at Cash 4 Coins we exchange 1 Euro coins and in fact any foreign currency or old British and Irish coins back into Sterling. Our service is super-fast, secure and allows you to change any foreign currency back into Sterling. If you go on regular European business trips or holidays (lucky you!) and you have lots of 1 Euro coins knocking around in drawers, purses, jars or wallets, we can help you to turn these into Sterling that you can use for the things you need. The problem in the UK is that the banks will not exchange 1 Euro coins as it is simply not worth their while to do so. That means our customers are often left with pockets jangling with coins they can no longer use. If you are not sure when you will next be visiting a Euro zone country, you can exchange your 1 Euro coins with Cash4Coins today and we are standing by to help you. Speak to our team now about any aspect of our service or simply view our FAQ to find out how you can send us your coins. We would be delighted to help you. Once we receive your coins we’ll then sort and count these and then e-mail you a valuation offer. If accept this then we’ll pay you directly into your bank account – it’s really that easy! In fact it’s the best way to exchange 1 euro coins in the UK. In the unlikely event that you don’t accept our valuation then we’ll return your coins at our expense. We have loads of satisfied customers and you can see their comments on this website. We are also the trusted partner for charities, schools, businesses and hospitals. For lots of fundraising ideas, call our team and we can give you more information about arranging a foreign coin charity collection or other ways to raise awareness of these poor coins going to waste. You’ll be amazed at the response you receive. If you’d like to discuss how to exchange 1 Euro coins or any foreign currency then we’d be delighted to talk to you. Contact us today.